I really enjoyed my week's holiday in New York, and as one might expect the food played a large part in that. Rather than do loads of blog posts (I really can't be arsed nowadays) here's a round-up of some of my favourite eats in the Big Apple. The dimly-lit dining room at Minetta Tavern, while terrible for food photography, is one of the most buzzy, atmospheric ones I've eaten in. And I've eaten in a lot. I kicked off with a generous portion of roasted bone marrow served with shallot confit and baguette soldiers while my friend went with roast baby beets. Both got the thumbs up. For mains, we both ordered the legendary Black Label burger. Made with prime cuts of dry-aged beef, topped with caramelized onions and served in a sesame-topped brioche bun, this was without doubt the best burger I've ever eaten. Oh, and the big mountain of fries were bloody amazing, too. Overall, Minetta Tavern was probably my favourite out of all the restaurants I visited in New York. This begs the question whether Keith McNally opened the wrong restaurant in London. Kesté Pizza & Vino serves pizza the Neapolitan way with a wood-fired brick oven taking pride of place at the back of the shop. 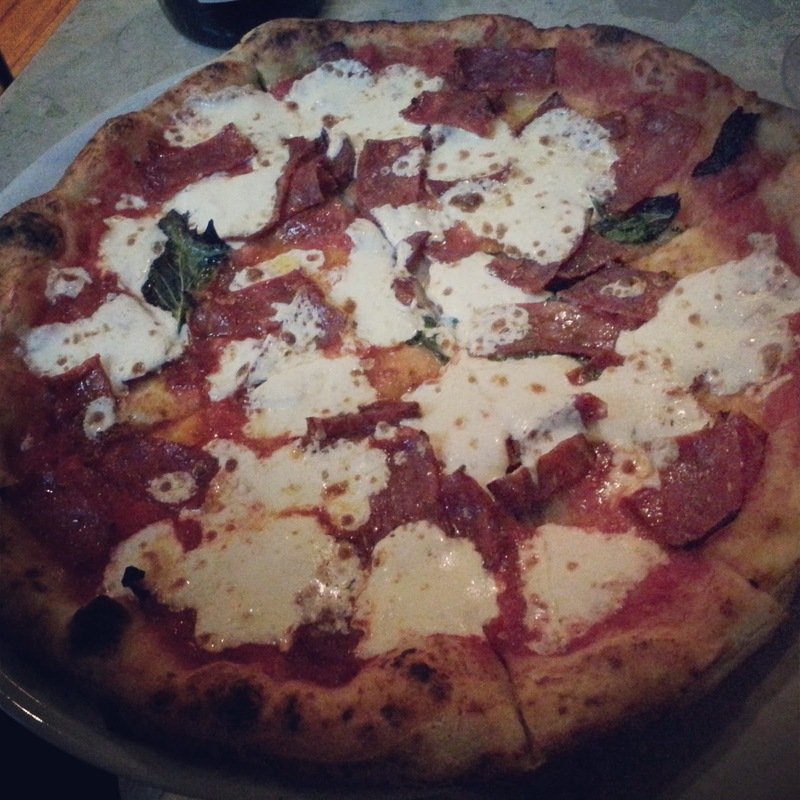 My diavola pizza was pretty much perfect with its blistered chewy crust and quality toppings of homemade mozzarella, spicy soppressata and fresh basil. My friend enjoyed his pistacchio a salsiccia pizza with its subtle pistachio pesto topping and moreish sausage meat. As the name of the restaurant suggests wine is of equal importance to the pizza and this is reflected by the excellent wine list. Along with Biang! 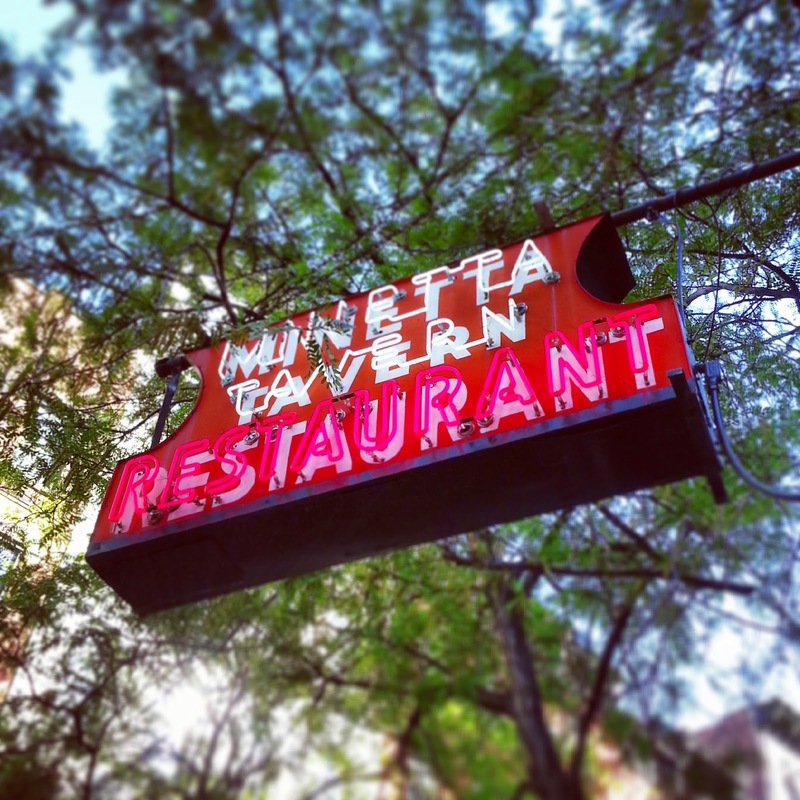 and the Minetta Tavern, this small pizzeria is on my A-list of New York eateries. Choosing where to eat in Manhattan's Chinatown is a risky business. One false move and you could end up in a tourist trap. So I was thankful that I had some local knowledge to fall back on in the form of coolcookstyle's recommendation of Shanghai Café Deluxe. 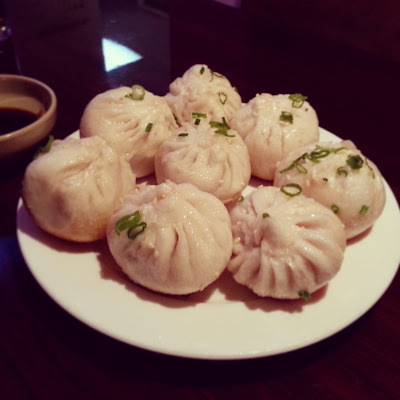 Being a caff specialising in Shanghainese food, both 小籠包 xiao long bao (soup-filled pork dumplings) as well as the less well known 生煎包 sheng jian bao (pan-fried soup-filled pork buns) were ordered. Of the two I preferred the latter; I think this might be to do with the fact that sheng jian bao, with their juicy pork filling and crispy bottoms, are nigh on impossible to find in London. Incidentally, these two dishes are listed on the English language-menu as steamed tiny buns with pork and fried tiny buns with pork. Fette Sau may not be the best barbecue joint in New York (the twitterverse told me as much) but it is ideally located to kick off an afternoon out in Williamsburg. 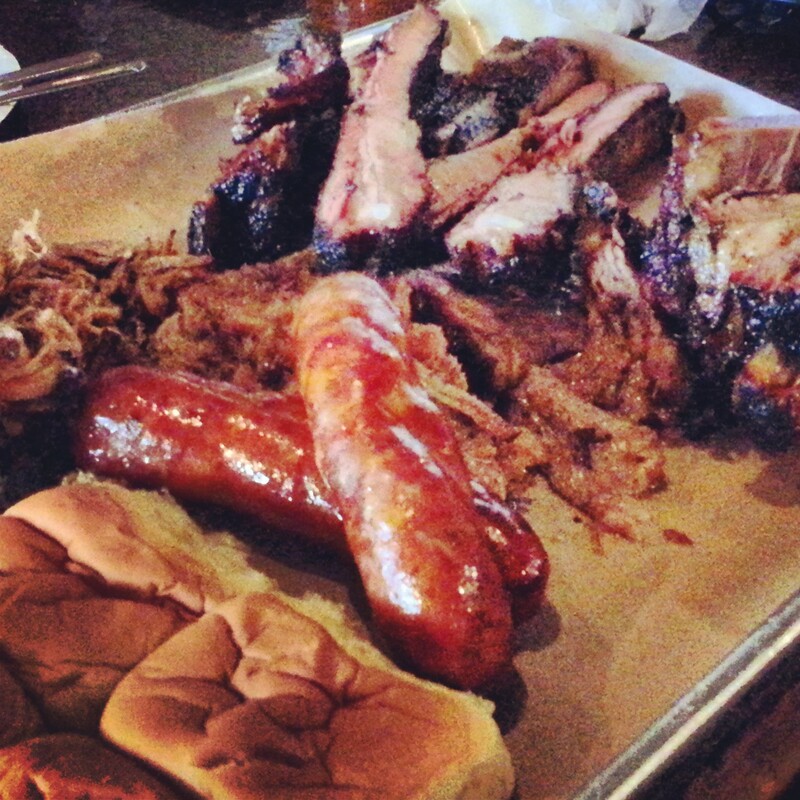 I know sod-all about proper American barbecue and have precious little experience of it. So for what it's worth, I thought the pulled pork shoulder, beef short rib and beef brisket were decent enough but that the pork ribs and pork sausages were better. I liked the casual fun vibe of this converted auto repair shop so it was a shame that our lunch was slightly spoiled by rude and inattentive bar service (by the way, the food counter service was just fine). 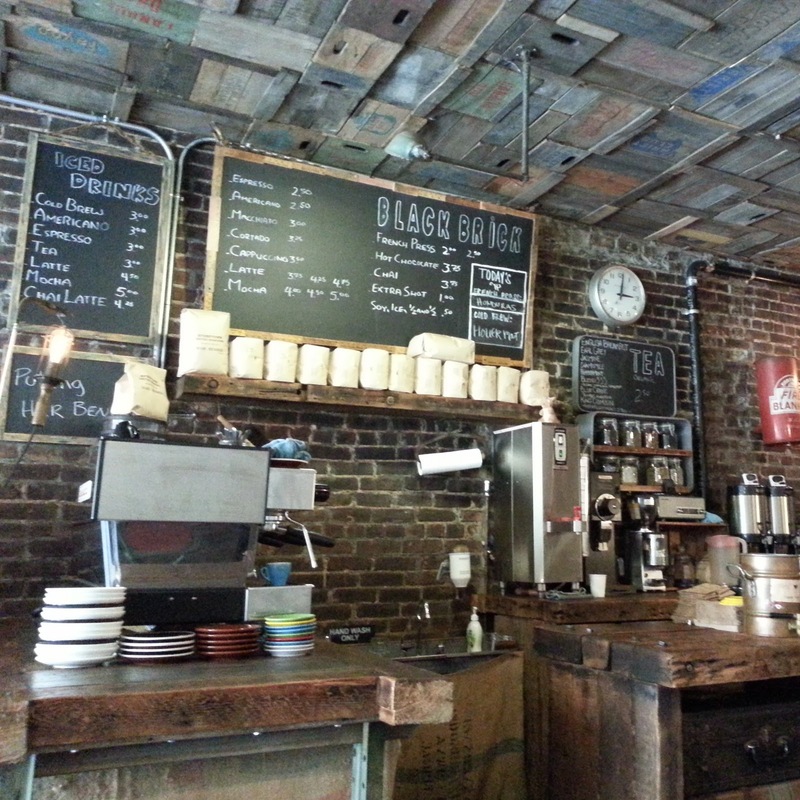 I'm pleased to report that there were no such service fails at the excellent Black Brick. Some haters may dwell on the overtly hipster interior design, but quite frankly who cares when the coffee is so damn good. The barista's attention-to-detail was a sight to behold and he also found time to have a friendly chat whilst making my brew. This coffee shop is an ideal pit-stop when strolling along Bedford Avenue, the main drag in Williamsburg. All power to hipsters! Tribeca Grill may no longer be the place to be seen, but I enjoyed my Sunday brunch at this glamorous restaurant famous for being part-owned by Robert De Niro (I had a good look around but Bobby was nowhere to be seen). I adored my jumbo lump crab cake, which as promised had jumbo lumps of sweet white crabmeat. This was perfectly paired with chipotle roasted corn and cilantro avocado mousse. My mate enjoyed his scrambled eggs, country gravy & buttermilk biscuit so much, he didn't offer me any. And do remember to order the basket of bread & pastries if only for the amazing banana bread. This was a fine last meal before heading off to the airport. To conclude my round-up, here are a few places where I enjoyed drinks and snacks. Eataly, Mario Batali's gastro-shrine to all things Italian, has no less than seven restaurants. 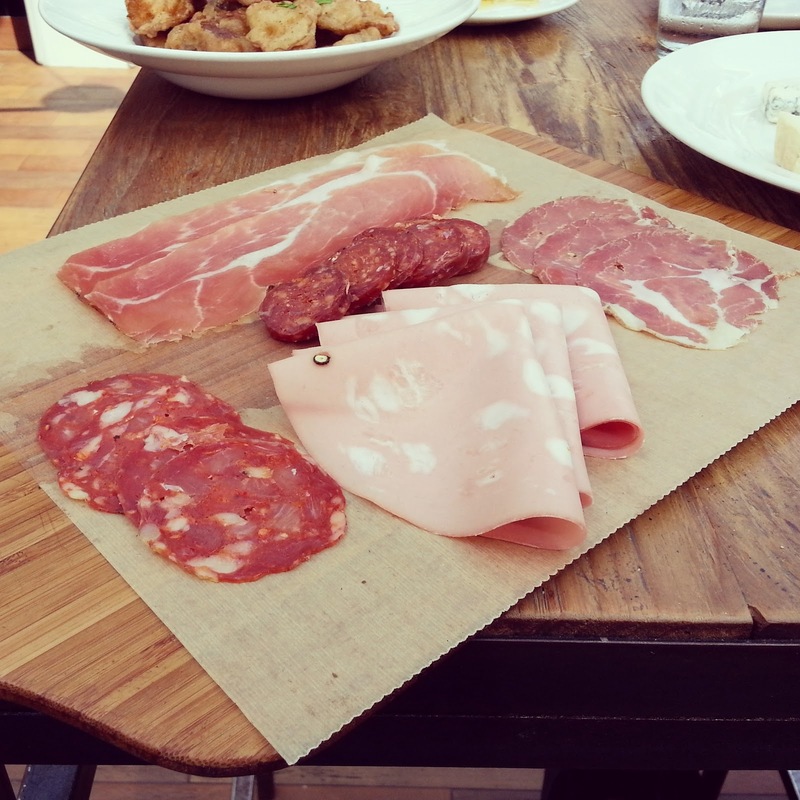 Being a sunny day I popped up to the rooftop beer garden, Birreria, and enjoyed a fine platter of salumi. To top-up my Britisher points I spent an enjoyable Friday night at April Bloomfield's gastropub, The Spotted Pig. Next time I'll save some space to eat more than just my share of pork rillette and some shoestring fries. Happy Hour is a great time of the day to take a breather from sightseeing whilst plotting where to go out at night. I found this was best done over drinks, some truffle fries and half a dozen littleneck clams from the raw bar at McCoy in Greenwich Village. [NYC Postscript – updated August 2013] After having a great holiday in New York in May, it was a pleasant surprise to return so soon after for a business trip. This, of course, meant more eats and here's a quick round-up of some more places worth checking out. There are two very good reasons to visit the Standard Hotel in the Meatpacking district even if you're not a guest: the Standard Biergarten and the Standard Grill. Enjoy German beer in the former before going to the latter to tuck into seafood from the raw bar followed by treats such as seared scallops. 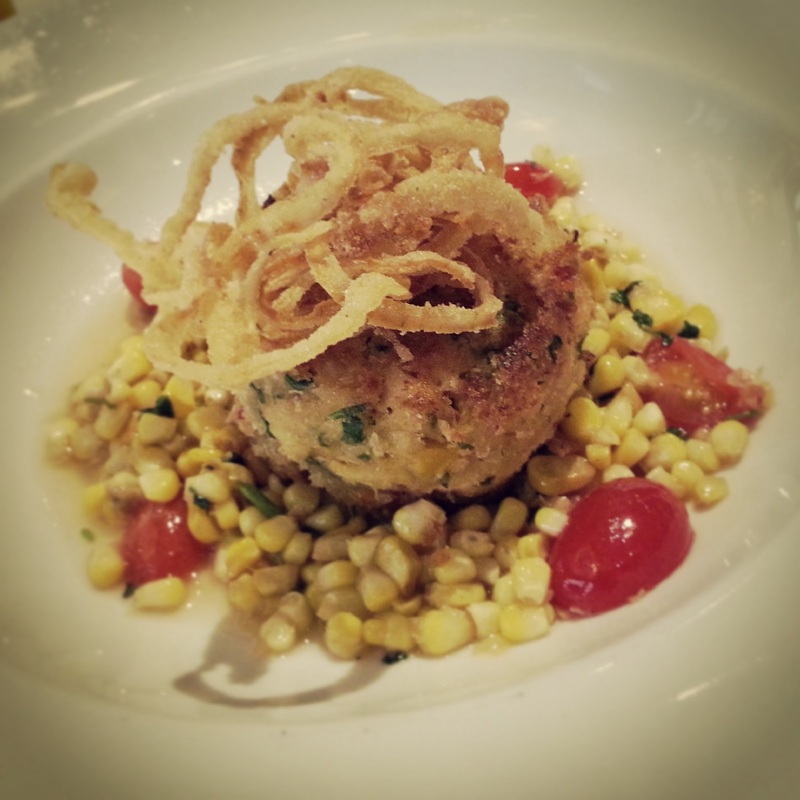 A short distance from the Standard Hotel is Fatty Crab in the West Village. I'm not entirely sure what my Malaysian friends might think about this take on their cuisine, but I was a big fan of the signature chilli crab as well as snacks such as coconutty chicken wings and seasonal salad. 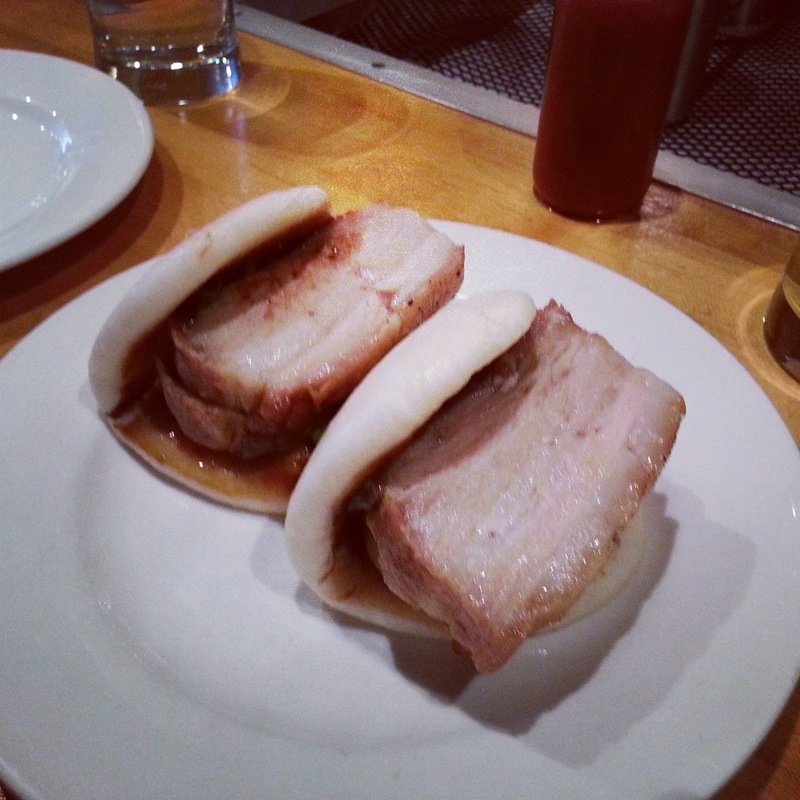 Taiwanese-style gua bao seem to be taking over the world at the moment and New York is no exception. Of the bao I tried I liked the belly pork-filled Chairman Bao at Baohaus but preferred the pork buns over at Momofuku Noodle Bar, although they were so amply-filled with pork belly it left little room for the slightly-lacklustre Momofuku ramen. My last tip is an example of what the Big Apple does best: ambience. I have no doubt there is better Japanese food in New York but for a good time vibe, there's no beating the Blue Ribbon Sushi Izakaya. Strictly speaking, Flushing in Queens isn't New York's other Chinatown, as the Big Apple boasts no less than seven Chinatowns. That said, those-in-the-know consider Flushing to be the one with the best food. Which is why we headed out there to try Biang!, the first proper sit-down restaurant from the highly regarded Xi'an Famous Foods stable. Being a contrary sod, my first impressions were that the restaurant was too trendy; you know what I mean, exposed brickwork and filament lamps. It felt a bit out of place alongside the more utilitarian feel of Flushing Main St. 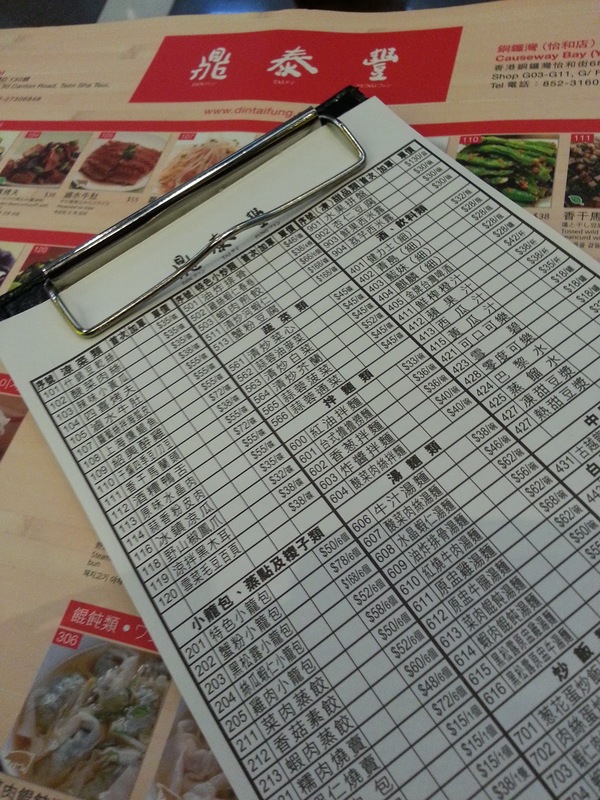 However, this inverted snobbery soon evaporated when I saw the menu, which majors in the cuisine of Xi'an, the capital of Shaanxi province in northwest China. 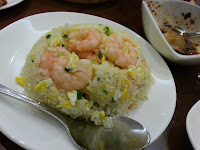 This style of food, whilst undeniably Chinese, has Middle Eastern influences given the city's location on the Silk Road. The main calling card of Biang! is biang-biang noodles from which the restaurant takes its name (biang being the sound made when the noodle dough is thwacked against the work surface). These broad hand-torn noodles are served with a number of toppings at this restaurant. We went for the stewed oxtail biang-biang noodles (腊汁牛尾biang-biang面 $7.50) and spicy & tingly beef biang-biang noodles (麻辣牛肉biang-biang面 $7.00). Soup noodle versions of most biang-biang dishes are also available but we stuck with the dry versions given the scorching weather and greater difficulty in sharing soup noodles. Both bowls of noodles were superb, as the gravy from the stew clung on to the chewy broad hand-torn noodles. My favourite was the oxtail with its warming flavours from star anise, cloves, cassia bark and dried citrus peel. 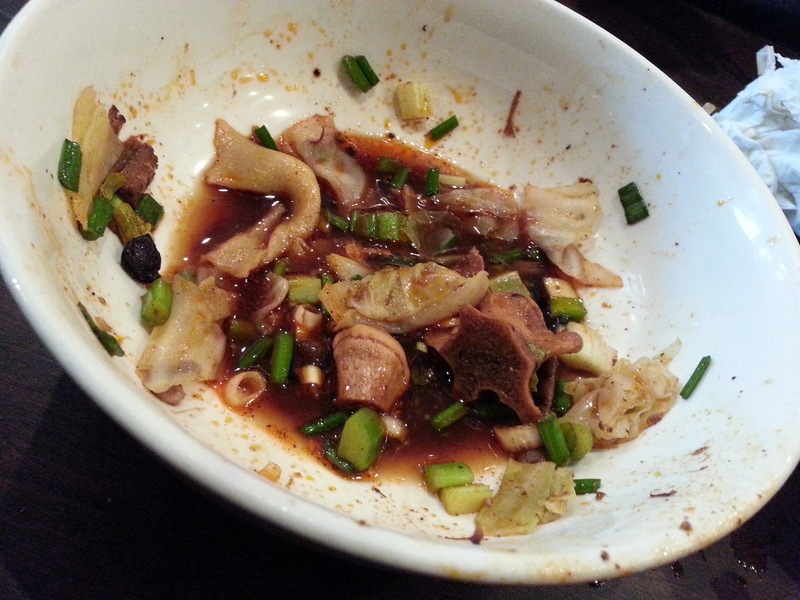 In contrast, my friend preferred the beef with its punch from the Sichuan peppercorns and chilli. 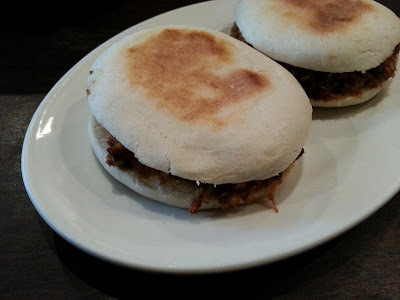 Another famous Shaanxi dish is roujiamo (肉夹馍), which can be found on the menu in English as stewed pork burgers (腊汁猪肉夹白吉馍 $5.00/2pcs). These flatbread sandwiches with stewed belly pork filling were very moreish. I was particularly impressed with the quality of the flatbread that I thought superior to the ones I've tried in China. We also ordered spicy cumin lamb skewers (孜然羊肉串 $4.50/3 pcs with extra skewers for $1.50 each). These were swiftly eaten when despatched from the charcoal grill. 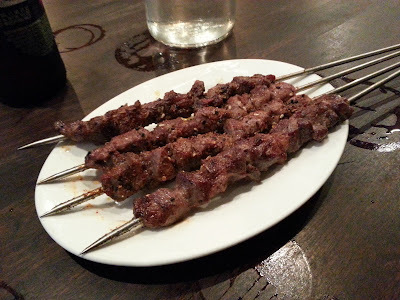 I liked the juicy lamb skewers but I thought the chilli somewhat overshadowed the cumin. But really, that's not a big deal. There are other skewers on offer including esoteric body parts and organs as well as more prosaic offerings such as chicken. A quick mention, too, for the drinks list; my beer-loving friend was impressed that it included some American craft beers in addition to better known Chinese and international branded beers. Incidentally, wine is not served but you can bring-your-own for corkage of $8/bottle. Overall the bill for the two of us came to a bargainous $45 including a round of beers and a generous tip for our cheery and exceedingly helpful server. Biang! is a restaurant I would certainly return to if I ever went back to New York. Its menu is really interesting and ideally I would've corralled a bigger group to give it a good going over. Some might be put off by its location in Flushing, but the No. 7 subway train only takes half an hour from Grand Central Terminal, which is no time at all to travel for great food. 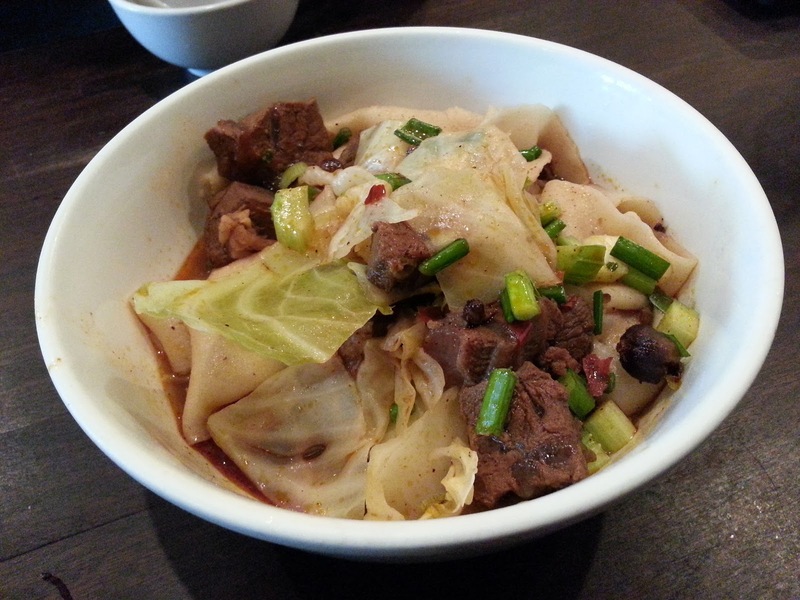 But if you can't be bothered to go to Flushing then there are three branches of Biang's sister operation Xi'an Famous Foods in Manhattan, which serves a similar menu albeit in less comfortable surroundings. 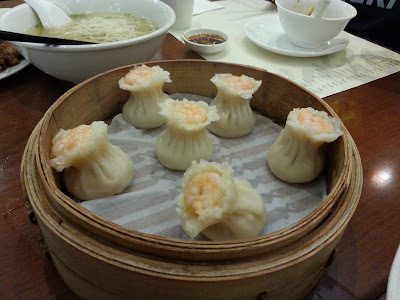 PS: Click here to read about the Shaanxi food I ate in Beijing and here about where to find it in London. 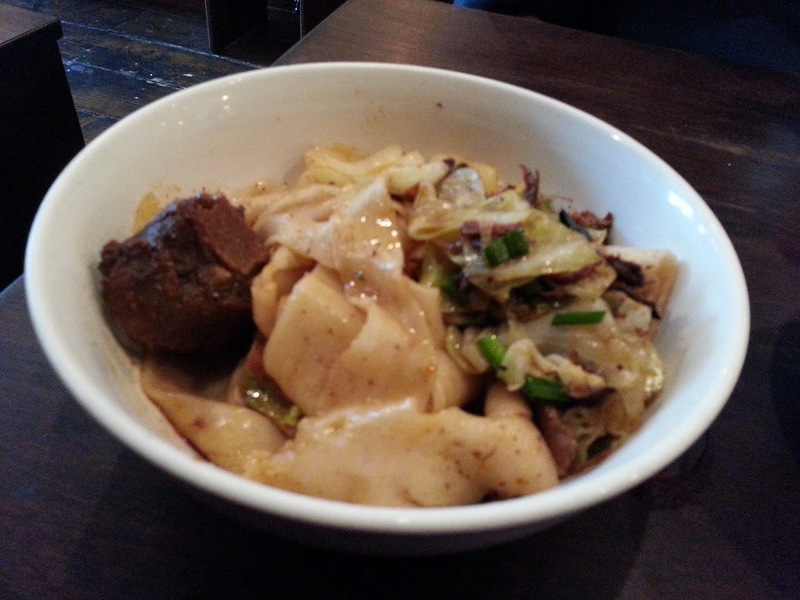 And this post by Hollow Legs may be of interest if you fancy having a crack at making biang-biang noodles. 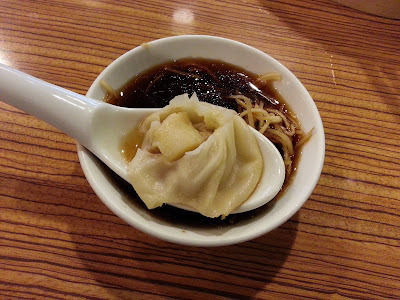 What with my track record, I know you're not going to believe me when I say I didn't mean to visit Din Tai Fung (鼎泰豐) three times in eight days in two different cities. But I did. First up was a solo visit to the Takashimaya Times Square branch in Tokyo. This was followed with a couple of visits to the Causeway Bay branch in Hong Kong, where I had one meal with a colleague and another one with family. 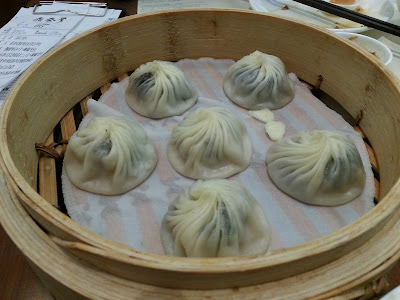 Naturally, as with any trip to Din Tai Fung, I decided to check out the signature soup-filled xiao long bao (小籠包). I've probably banged on about these far too much over the years and the classic pork xlb in Tokyo didn't disappoint. I also ordered a steamer of three kinds of seafood xiao long bao (海鮮三種小籠包). Of these, my favourite was the pork & scallop with the pork & crab a close second, but I wasn't overly keen on the pork & sea urchin, as the sea urchin was a bit overpowering. 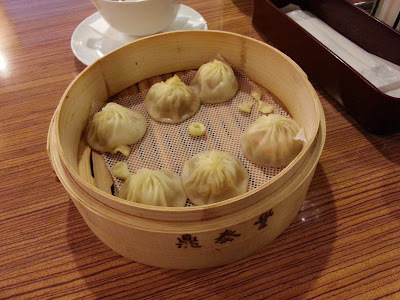 Over in Hong Kong, I thought the classic pork xlb and pork & crab xlb were better than in Tokyo but of these were eclipsed by the sublime pork & black truffle xlb (黑松露小籠包), where the rich truffle filling was out of this world. 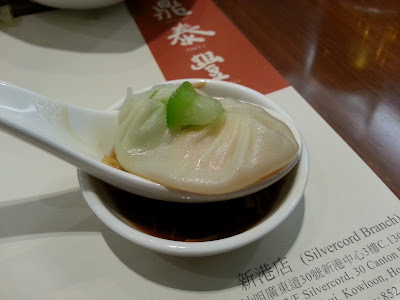 I also enjoyed the unusual angled luffa & shrimp xlb (絲瓜蝦仁小籠包) – this is a little different with its clean tasting, refreshing filling of silk gourd (aka angled luffa). 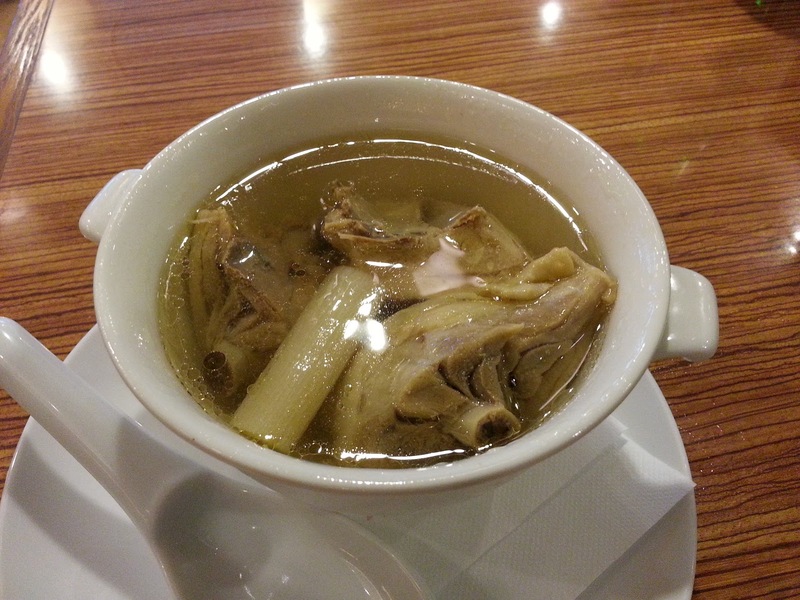 Of the other dishes in Tokyo, I was a bit disappointed with the steamed chicken soup (原盅鮮雞湯). In other branches of Din Tai Fung I've been to, this soup has been outstanding, but the version here was lacking flavour and a bit oily to boot. And the shrimp fried rice (蝦仁蛋炒飯) was decidedly lacklustre, too. I mean, just look at the photo of the version in Tokyo on the left compared to the one in Hong Kong on the right. 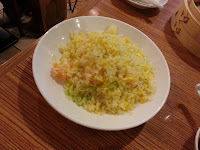 Rather bizarrely, the fried rice came with a konbu seaweed soup, which is a Japanese, not Chinese, affectation. That and the use of local vinegar rather than Chinkiang vinegar also grated. So while the signature xiao long bao were excellent in Tokyo, the support acts were the weakest I've come across in any branch of Din Tai Fung I've visited. However, this is all relative, and the positives far outweigh the negatives. In particular, I was very impressed by the service. Having sensed my total lack of Japanese language skills, a Mandarin-speaking waitress from Taiwan was assigned to look after me. My Mandarin is pretty shoddy, but it was a nice gesture nonetheless. Any lingering disappointment from my visit to the Tokyo branch was soon eradicated in Hong Kong. To be precise, it was a cold noodle salad, bizarrely described in English as garlic pork green bean fettuccine (蒜泥粉皮肉), which restored my faith in Din Tai Fung. I just loved this winning combination of soft pork slices, crunchy cucumber slithers and wobbly broad fen-pei noodles in a garlicky soy vinegar dressing. 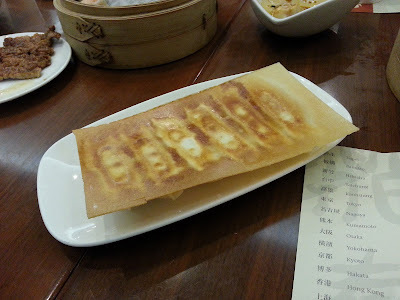 We also tried the fried shrimp & pork potstickers (肉蝦仁煎餃) for the first time, which were, as is the fashion nowadays, served upturned stuck onto a fried dumpling pastry sheet. This is a bit gimmicky in my opinion, but it did spark off a conversation of how they were constructed. These were good, but there are probably other things I'd order off the menu first. Stuff like the open-topped shrimp & pork shao mai (蝦仁燒賣) and the various wonton dishes are higher up in the pecking order in my opinion. 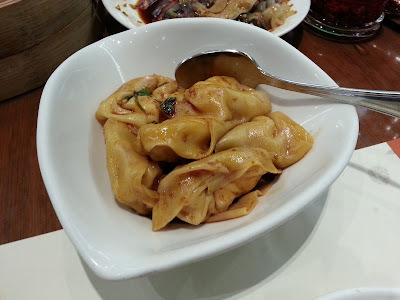 Of the wonton dishes I preferred the spicy shrimp & pork (紅油抄手), which had a real kick, to the ones in special sauce (乾拌菜肉餛飩). Memo to Din Tai Fung management, I wouldn't use the term 'special sauce' should you decide to open in Britain. How meticulous, there's a guy weighing out dumpling dough in the kitchen. The dumplings here really are quite exceptional; this is a PROPER restaurant, they don't take short cuts. Mind you, they could've been a bit more generous with the crab in the pork & crab XLB. My favourite? Probably the wontons in spicy sauce; the sauce has a proper kick. 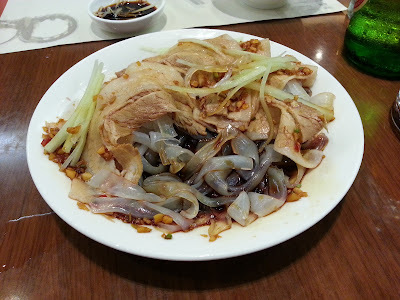 The pork chop with soup noodles (油炸排骨湯麵) is good, too – nice tender meat with good 5-spice flavour. But the rice, the fried rice, it wasn't fluffy enough, a bit too hard. But anyway, I like it here. Is there one of these in London? It'd make a fortune there. A fair assessment by Pa Noodles, although I think he was a tad harsh about the rice! My mum liked Din Tai Fung too, although she didn't really rave about it. The thing is she's rarely effusive about food that isn't Cantonese. And my colleague liked it so much he's planning to visit the branch in his hometown of Sydney. Me? I've been to the Causeway Bay branch in Hong Kong four times now, and I love it. If only they could open one in London – I know it's a forlorn hope, but here's the link to my petition anyway.